The fifth of our fifteen-part series of articles examining Thief II’s level and mission design returns to a classic layout with a twist – the Eastport Mechanist Seminary. Having escaped an attempted ambush by the City Watch, Garrett’s presence is “requested” by The Keepers. Though unimpressed with their talk of prophecy, he remains aware enough of his own position in The City to not disregard their advice when it is offered; after all ,”Keepers never alter the truth, just keep it in the shadows.” In order to learn more about Sheriff Truart’s motivations, Garrett is advised to visit the Eastport Mechanist Seminary and overhear what he can. 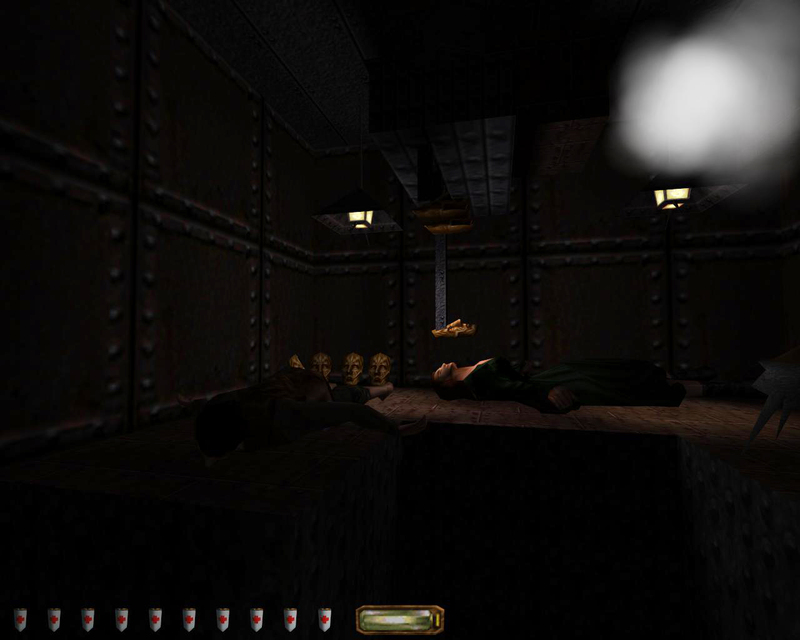 The fifth level of Thief II: The Metal Age – occurring after Garrett has been forced out of his symbolic normality when he is given cause to flee his home – Eavesdropping serves as an introduction to the Mechanists. Their presence will grow in the background of the subsequent levels as they develop into the game’s true antagonists. The narrative threads that started in Framed continue into Eavesdropping and the subsequent four levels, which together form the second act of The Metal Age and witness the resolution of the Sheriff Truart plotline, along with a series of discoveries that lay the foundations for the third act’s focus on the Mechanists themselves. It’s only after Trail Of Blood, and Garrett’s reunion with an old frenemy, that the Mechanists to move from the background to the foreground. For now, however, things seem relatively straightforward. Sheriff Truart is working for somebody and whoever it is has reason to want Garrett dead. In The City, forewarned is forearmed, so it’s time to find who’s been pulling the Sheriff’s strings. Your initial objective is to reach one of the doors to the Mechanist conference hall and, once there, listen to the meeting between Sheriff Truart and whoever he has been working with. As the conference hall is separated from the main church building, it is relatively easy to reach it and complete your first objective. Unfortunately, what you overhear is enough to not only cause a change in your objectives, but to complicate the plot of The Metal Age and set Garrett down a path he had been trying to avoid. 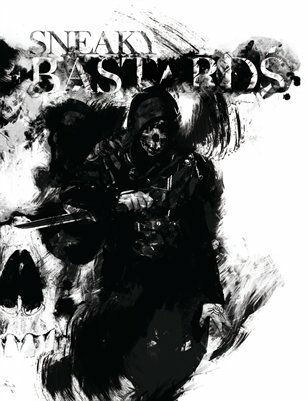 Sheriff Truart is working with Karras, the leader of the Mechanists, providing him the bodies needed to create his Masked Servants. Karras in turn has recorded the incriminating conversation to ensure Truart’s continued cooperation as, despite all his posturing, there is still one person the Sheriff fears. The Baron, rarely mentioned and never seen, remains the true authority in The City. If Garrett is going to get Truart off his back once and for all – and find out why Karras wants him dead – he is going to need the wax cylinder recording, which means finding and making a copy of the key to the Safety Deposit Box into which it is due to be secured. Contained within high exterior walls that separate it from the rest of The City, the Mechanist Seminary in Eavesdropping is a classic closed level, comprising a single location somewhat smaller than Shoalsgate Station. 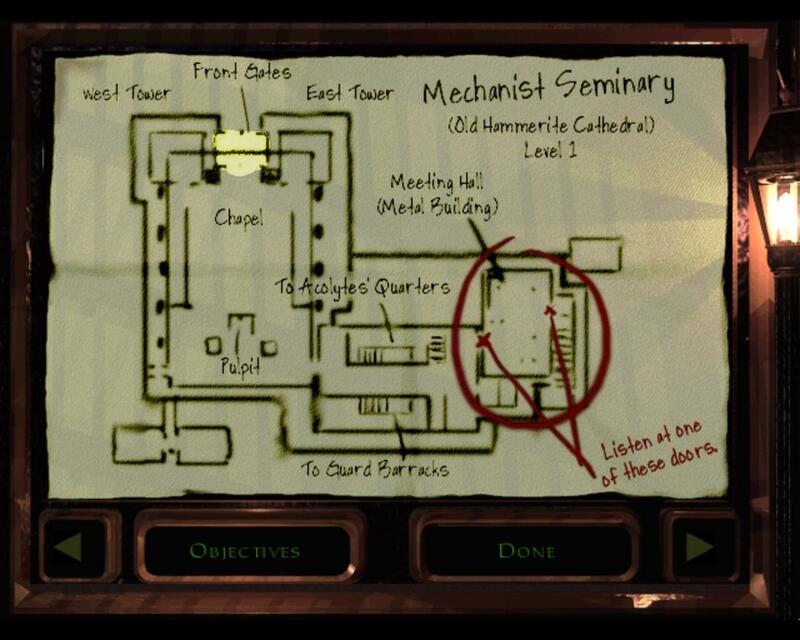 There is a complication, however: the key itself is somewhere in the Seminary compound, but its exact location is only determined when the level loads. You will need to remain in place until after the Sheriff has departed in order to hear Karras tell his subordinate where it can be found. West Storage Room in the Church. Storage Shed atop the Acolytes’ Quarters. On the body of a dead Mechanist in the Catacombs. Top floor of the West Tower. Top floor of the East Tower. You can collect the keys from the other locations, but doing will cause Garrett to comment about it being the wrong key. Once you have located the correct key it’s important to remember where you found it. as you will need to return it to its original location after making a mold, otherwise the wax cylinder will never have a chance to be placed within the Safety Deposit Box for you to steal in the next level. The location of the key is never recorded as part of your objectives, and there is no way to find out without listening at the door to the conference hall. If you miss Karras describing the location, or forget, then you will need to keep collecting keys until you have grabbed the correct one; your objectives will update once you do so. In the game files for The Metal Age are fourteen separate audio samples of Karras detailing the location of the Safety Deposit Box key. This has let to some confusion over the number of possible places in which the correct key can be found. Of the fourteen audio clips, only ten are ever used, and these correspond to the ten possible key locations detailed in the main text. Two of the clips are duplicates, referring as they do to the “storage shed” and the “shed atop the Acolytes’ Quarters” which are the same location. Three more refer to areas that do not exist in the final level, the “Kitchen”, “Gallery”, and “Loft” respectively. Disrupted in their place of rest, their souls bound for eternity to their Hammerite vows, a pair of skeletal Haunts patrol the catacombs underneath the Seminary complex. The Eastport Mechanist Seminary in Eavesdropping is one of the most physically complete levels in The Metal Age. From your starting point, you can circle the entire complex before you even need to enter any of the buildings. Once you do, the only locked doors that cannot be picked are those at the very front of the church – which can be entered in several other ways – and those to the conference hall. Despite being completely inaccessible, you can walk around the entire conference hall, solidifying it as a contiguous part of the Seminary compound. Though described as a “Hammerite Cathedral”, the main structure of the Seminary compound is smaller than the cathedral Garrett visited in The Dark Project. Symmetrical in layout, with two towers flanking the central nave, stairs against the walls to either side of the pulpit rise to a balcony that overlooks the ground floor and provides access to the first floor of the towers. 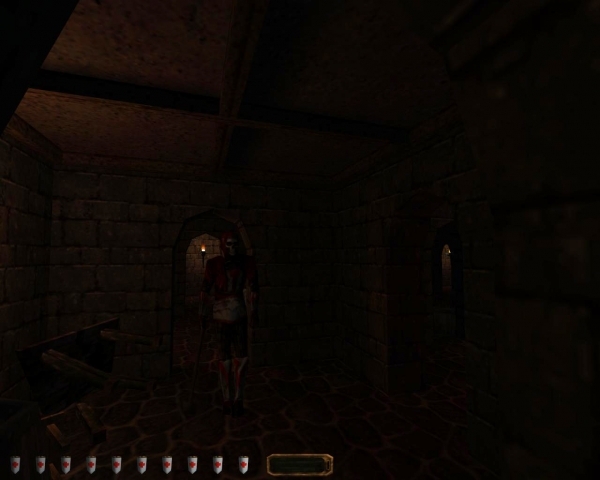 Guarded by a crossbow-wielding Mechanist, the first floor of each tower opens to a balcony that looks out over the main entrance to the Seminary. These are some of the possible entrances that Garrett details during his pre-mission briefing. The wooden frames around each balcony make good targets for a rope arrow, and entering the church from an elevated position will grant you a better view of the Mechanist patrols on the floor below. An adjunct to the church itself, the dormitory building, which holds the Acolytes’ Quarters and Barracks, is nonetheless built from the same stone – suggesting it was created by the Hammerites sometime close to the original construction of the cathedral. The same cannot be said for the conference hall, which has been built entirely from metal, marking it out as a later, and possibly Mechanist, addition. Differentiated not only by its material construction but also its size relative to the adjacent dormitory building, the conference hall, your initial objective, is easy to identify. On the eastern side of the building, between it and the exterior wall of the Seminary compound, close to the Hammerite graveyard, a set of stone steps ascend to a simple locked metal door. This is one of the two locations from which you can overhear Sheriff Truart’s meeting with the Mechanist leader Karras. As you approach this door, or the one inside the dormitory building, the Seminary bell in the west tower tolls – despite it being, somewhat confusingly, made of wood – and the meeting begins. Whispers, murmurs and ghostly laughter echo around the gravestones. With the location of the key revealed, you will now need to “borrow” it and find some way to make a wax impression so that a duplicate key can be made. Only once this has been done can you return the key to its original location and finally leave the Seminary compound. Though smaller in size than many of the levels you will have explored previously, the nature of your objectives – including the need to secure a certain quantity of loot – means that a lot of your time within the Eastport Mechanist Seminary will be spent exploring in order to determine how to complete them. In the basement below the dormitory building, the Mechanists have a workshop, where a mold and a forge are used to manufacture small metal components. Once you have found this, you can use the former to create a mold of the Safety Deposit Box key to take with you. Though the location of the workshop is listed on your map, there is nothing that explicitly indicates this is where you need to take the key once you have found it. Only by descending to the basement level and exploring what you find down there will you be able to complete your primary objectives. Locked behind a door outside the workshop, the network of catacombs below the church are patrolled by a pair of Hammer Haunts. Various treasures can be found within and if you navigate them fully they lead to a set of stairs that provide another way into the church. In a small space built into the walls of the Seminary Compound, behind locked doors, can be found your first glimpse of one of the Mechanist’s Metal Servants. Lying on slabs against the wall, watched over by the Metal Servant, are the bodies of two civilians who appear to be in the process of being “changed”. Bubbling away at the back of the space are two vats containing a pair of Metal Servants, potentially in the final stages of their transformation. The one and only secret of this level can be located within this space: a small level beside one of the doors opening a panel in the floor where a stack of bodies can be found. Whether these are the result of failed transformations, or those next in line for the process, is not clear. When Sheriff Truart talks of providing Karras with “vagabonds, street scum, prostitutes, those who will not be missed by anyone of consequence”, these are who he means, and this is the fate that awaits them. Eavesdropping sees the introduction of both the Mechanist Combat Bot and the smaller Worker Bot. The former is likely the first you will encounter as it can be found patrolling around, and through, the church. A hulking mechanical creation equipped with an arm-mounted cannon, the Combat Bot reacts to both visual and audible stimuli and presents a formidable challenge unless you know the one weakness they share with their smaller brethren. Found walking around the basement workshop, the smaller Worker Bot is blind, operating on sound alone until it becomes alerted when finally its single mechanic eye opens. On a bench inside the workshop, a note from one Mechanist to another details a continuing problem with their mechanical constructs: their boilers. Visible as a red glowing section on their backs, their boilers are vulnerable to water, with enough of it able causing complete paralysis. As an encouragement to put this to the test, two water crystals have been left by the note, which is more than enough to disable the lone Worker Bot in the workshop. Given that the workshop is one of the few locations that will always need to be visited to complete your objectives, it’s likely that all players will find this note and learn the weakness’ of the Mechanist bots; knowledge that will become useful going forward, and especially in the next level. As a former Hammerite Cathedral, it’s hard to miss the symbolism of that now all-but-defunct order. The towers that flank the church still have stained glass windows in the form of hammers, while the graves, crypts, and catacombs are full of smaller signifiers of the Hammerites’ presence. As your first full introduction to the Mechanists, the mission shows them as an order not fully divested of their past associations. Later visits to the Mechanists’ buildings of Angelwatch and Soulforge are free of such connections to the past, and show how the Mechanists have grown in power and influence. Though smaller in absolute terms than Shoalsgate Station, the Eastport Mechanist Seminary is no less hostile. From your starting position, the church is an imposing presence, rising high above, where the City Watch headquarters sprawled out in all directions. If Shoalsgate was a physical representation of the bureaucracy of the City’s uniformed police force, then the Eastport Mechanist Seminary conveys the harsh authority of its soon to be dominate religion. Where in previous levels torches and gas lamps were common, here they are present in limited numbers and most commonly in those areas of the compound that still contain remnants of the Hammerites: the towers and the catacombs. Most of the Seminary compound is lit by electric lights, and though some can be turned off by wall-mounted switches, most cannot. In terms of illumination, the level is much more static that the likes of Shoalsgate. Corridors that are brightly or partially illuminated will remain that way throughout your time in the Seminary compound and, without a way to change that, you are forced to compensate for it. Acting as a counterpoint to this is the increased focus on different floor materials, and the sound created by your movement across them, metal floors are common throughout, serving to denote pathways around the buildings and as a means of highlighting areas of importance. Those areas that are not covered in metal floor panelling are frequently composed of other types of hard surface like stone. There are no carpets to be found anywhere within the Eastport Mechanist Seminary. Unlike previous levels, it’s not Garrett’s Water Arrows that will serve him best here, but the footfall-deadening Moss Arrows. A mixture of static and patrolling Mechanists mean that, despite the relatively wide corridors within the Seminary compound, few spaces feel entirely safe. Throughout, you can hear footsteps all around – a situation exacerbated by the abundance of hard surfaces. 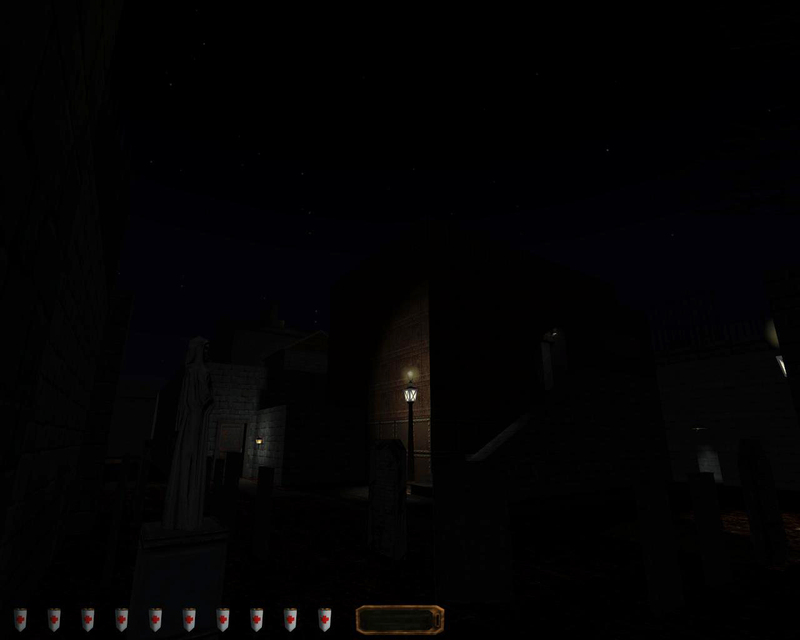 There is relative safety outside the Seminary buildings, between them and the compound’s exterior wall, but in order to complete your objectives you will need to enter those buildings eventually. No matter which of the many entry points you use, you will be forced into an encounter with at least one, if not multiple, Mechanists. Eavesdropping is a classic Thief level with an important twist. Without the random element provided by the location of the Safety Deposit Box key, Garrett’s visit to the Eastport Mechanist Seminary would feel overly straightforward after the levels that preceded it. Instead, what is a fairly standard level layout becomes something that feels different each time it’s played. However, this very element also means that the pacing of your experience can be inconsistent. As the correct key is selected at runtime, the challenge presented by your objectives can vary dramatically. If the key is in the basement workshop, then your main objectives can be completed in minutes, as you can collect the key from a location that is literally around the corner from the machinery needed to make a mold. Alternately, if the key is found in the Church pulpit, you will need to reach and return to a brightly lit location surrounded by metal floors in one of the most heavily trafficked parts of the level. Random elements are used in a slightly different, and more subtle, form in the next level, where Garrett uses his new copy of the Safety Deposit Box key to steal the wax cylinder recording from First City Bank and Trust – one of the most heavily guarded buildings in the City, and commensurately one of the most challenging levels in the game.